Summary: The environmentalist community has put their resources into fighting anthropogenic global warming. For reasons discussed in other posts, that campaign has achieved few of the political gains sought. Meanwhile the prosaic forces of commerce destroy the oceans through pollution and and overfishing. We can do better. The Census of Marine Life, a decade-long international survey of ocean life completed in 2010, estimated that 90% of the big fish had disappeared from the world’s oceans, victims primarily of overfishing. Tens of thousands of bluefin tuna were caught every year in the North Sea in the 1930s and 1940s. Today, they have disappeared across the seas of Northern Europe. Halibut has suffered a similar fate, largely vanishing from the North Atlantic in the 19th century. In some cases, the collapse has spread to entire fisheries. The remaining fishing trawlers in the Irish Sea, for example, bring back nothing more than prawns and scallops, says marine biologist Callum Roberts, from the UK’s York University. 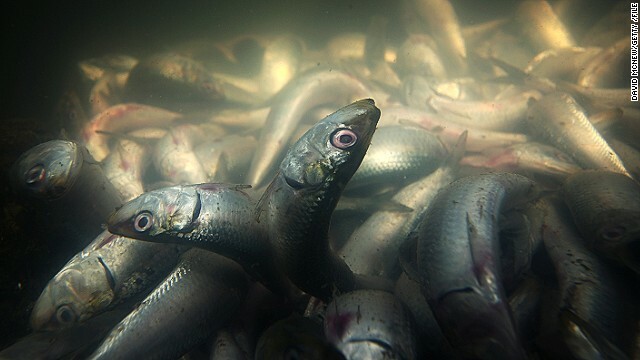 “Is a smear of protein the sort of marine environment we want or need? No, we need one with a variety of species, that is going to be more resistant to the conditions we can expect from climate change,” Roberts said. The situation is even worse in Southeast Asia. In Indonesia, people are now fishing for juvenile fish and protein that they can grind into fishmeal and use as feed for coastal prawn farms. “It’s heading towards an end game,” laments Roberts. One particular type of fishing, bottom-trawling, is blamed for some of the worst and unnecessary damage. It involves dropping a large net, around 60 meters-wide in some cases, into the sea and dragging it along with heavy weights from a trawler. Marine conservationists compare it to a bulldozer, with the nets pulled for as far as 20km, picking up turtles, coral and anything else in their path. The bycatch, unwanted fish and other ocean life thrown back into the sea, can amount to as much as 90% of a trawl’s total catch. Upwards of one million sea turtles were estimated to have been killed as by catch during the period 1990-2008, according to a report published in Conservation Letters in 2010, and many of the species are on the IUCN’s list of threatened species. Campaigners, with the support of marine scientists, have repeatedly tried to persuade countries to agree to an international ban, arguing that the indiscriminate nature of bottom-trawling is causing irreversible damage to coral reefs and slow-growing fish species, which can take decades to reach maturity and are therefore slow to replenish their numbers. “It’s akin to someone plowing up a wildflower meadow, just because they can,” says Roberts. Others have compared it to the deforestation of tropical rainforests. Bottom-trawling’s knock-on impacts are best illustrated by the plight of the deep-sea fish, the orange roughly (also known as slimeheads) whose populations have been reduced by more than 90%, according to marine scientists. Orange roughys are found on, or around, mineral-rich seamounts that often form coral and act as feeding and spawning hubs for a variety of marine life. “Anywhere you go and try to harvest fish with a trawl you are going to destroy any coral that lives there, and there is example after example of the damage that is done by trawlers,” says Ron O’Dor, a senior scientist on the Census of Marine Life. “If I ruled the world, they would be banned, they’re just such a destructive method of catching fish. Fishermen have other methods, such as long-line, that cause far less damage. “The disturbing truth is that humans are having unrecognized impacts on every part of the ocean, and there is much we have not seen that will disappear before we ever get a chance,” says O’Dor, who is also a professor of marine biology at Dalhousie University in Halifax, Canada. Why have activists focused so much on global warming over other issues? Perhaps because as a vehicle it offered more leverage to make political and social changes they seek. As David Hume learned at the Radical Emission Reduction Conference at the Royal Society. Los Angeles, June 2012. Photo by Lou Dematteis/Spectral Q.
I just returned from a week scuba diving in Roatan, Honduras. I have never, ever seen such trash in a Caribbean setting for any setting actually. Admittedly, there were very heavy rains in the 3-4 days prior to my arrival and that caused some washout from the land, but I was absolutely stunned. The trash was largely plastic. It was largely on the surface and thus is not likely to sink to the depths. And it is not as toxic as chemicals but yes still damaging. I get the sense that this type of “retail” pollution is going to be tough to take given the role that poverty (and culture) plays in it. Other than some high profile events (the Gulf) i get the sense that “wholesale” pollution like dumping or spills on a coporate or national level has slowed. Does anyone else get that sense? Am i being hopeful? Finally, over fishing: Thats going to be difficult as well. The search for protein is ever rising and the seas have always been an easy source. The portion on bottom trawling is horrible and should be solvable by treaty and rigorous enforcement (if enforced) Again, I am hopeful? I do not know if the USA bans bottom trawling either in its waters or by our fleet in international waters, but I can see opposition to such a ban coming from the same places that object to any form of Gun control, air quality standards and water quality standards, etc. See Wikipedia on “Bottom Trawling”. Most developed nations have some — often quite limited — regulations. In 2006 the US banned it off most of the Pacific coast, and has “severe” restrictions off our other coasts. This would be a useful subject for strong US pressure on other nations. That’s the leadership a global hegemon should do. In my 20+ years of diving the California coast, I have noticed that certain areas have had devastating damage over the years. I have not seen the damage first hand of trawling but definitely that cause by lost fishing gear, such as lines, traps and nets. The dive sites that I frequent on a continuing basis has been pounded by other divers with poor dining skills. The dive sites that are much farther for many people to frequent always has trash, mostly beverage containers and plastic. To add insult to the aquatic injury, openly trawling the ocean floor and only using a small portion of what is brought to the surface brings my personal strong morals to the surface as well. I imagine the damage is equivalent to several decades of poor divers crushing the sea floor. As I read the article and think to my self that if the figures are half of what is mentioned leads me to the same conclusion, this is unacceptable to allow this fishing practice. I for one, have always been an Ambassador of the seas and always will. Thanks for the first person testimony, from a different perspective. Good idea, really, and it would be a good distraction for the US military industrial complex. Really, I’d think they’d be into this, they have this equipment and not much to do other than kill random Muslims for no good reason. Instead they’d be more out in the ocean where mostly they wouldn’t bother any actual humans. It could be mostly good PR, really. I am so glad you keep bringing this up. And keep doing it. It is the ‘hidden tragedy’. Fishermen (and they are nearly always men) are the ‘strip miners’ of the sea. “This would be a useful subject for strong US pressure on other nations. That’s the leadership a global hegemon should do.”. And I do so agree. Some of the World’s real heroes are those out there taking on the things like the Japanese whaling fleets and so on. There are others of course. Like David I have done a lot of scuba diving and the dying of the Great Barrier Reef (to be fair not entirely from overfishing, though it contributes) is beyond tragic. But I saw it .. and saw that there is hope for recovery … in the scallop dredgers in Port Phillip Bay here in Victoria. When they went through there was just a desert left underwater. Every plant, fish, crustracian, etc was gone! Sort of small scale ‘long lining’ and the like. The Dogger Bank is a tribute to human insanity. You read the old account of how productive it was, you could put a bucket into the after and pull it out full of Cod. Now look at it. Overfishing is one of the very few areas that I relax my ‘no military violence rule’. And the Human cost direct and indirect. How many times has it got to be said that the problem (and it is a big problem, much bigger than gets much publicity) with the Somalian pirates was caused by collapse of their Govt and then foreign fishing vessels stripping all their fishing grounds. So the fishermen took to piracy. If only someone had the brains to use their, insanely expensive, navies to do something useful for a change…..
Pingback: Let’s defend the oceans, before it’s too late – Fabius Maximus (blog) | Protecting the Oceans. Pingback: Is our certain fate a coal-burning climate apocalypse? No! | Watts Up With That? Pingback: Are we really “choking the ocean with plastic”? Tracing the creation of an eco-myth | Watts Up With That?